What is the Average Tree Moving Cost? Total number of trees to be moved. Travel time to and from the site. Call us at (303) 682-1907; we would be happy to give you a quote! When Is the Best Time of Year for Large Tree Moving? Trees can be moved any time of the year if the right precautions are taken. That being said the best time for large tree moving is in the spring after the ground thaws but before the buds break. The second best time to move evergreens is in the fall from the beginning of September. The ground freezes in late November early December. A real advantage of large tree moving in the springtime is that you do not have to water and take care of them during the winter when you have to deal with frozen hoses or drained sprinkler systems. 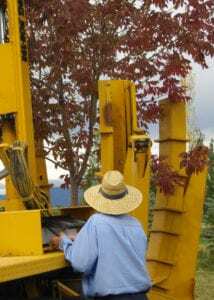 How Much Lead Time is Needed when Transplanting a Tree? We appreciate as much lead time as possible! It is a good idea to consult us when you are in the planning stages of a landscaping or other project. We are happy to give advice with the planning timing and logistics of your tree moving. By state law we need an absolute minimum of three business days to get underground utilities marked. How Will the Emerald Ash Borer Affect my Trees? Hear what the Colorado Department of Agriculture has to say! Click Here. Is Tree Taxi the Right Tree Moving Company for Me? Still wondering what your tree moving cost in Longmont or surrounding Colorado areas might be for large tree moving around your home or business? Call us at (303) 682-1907 or contact us through our website – just Click Here and we’ll get back to you with a quote as soon as possible!